I have always collected images of “The Blessed Virgin.” As a child and young adult I used to see her only as the Mother of Jesus. I now see her as so much more. She is the symbol of the Goddess in all of her glorious forms. As mother of “God” she represents the Divine Creator, the one who came “before”. She is the true source of creativity and life. She is love made manifest. She is the wisdom of Sophia. She is the compassion of Kwan Yin. She is indeed a “virgin” in the truest sense of the word. The word virgin has come to represent a more secular and sexual connotation over the years but this is our social mores at work and our need to put things in tidy little packages. In reality a virgin means “a woman unto herself”. It means a woman in charge of herself, owing her life to no person, no man, living her life from her center in sacred union with her blessedness, in sacred union with nature and her innate kinship with all that is. 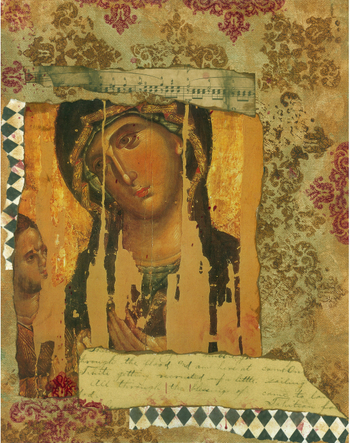 A virgin is a woman who forges her own path while honoring her ancestors and her past. A virgin is a woman who makes no excuses for her decisions and feels no need to explain or justify herself. A virgin is a woman who is so strong within herself; she is utterly open and vulnerable while feeling no need to defend her beliefs and actions against anything or anyone. And when true danger arises, a virgin's response is swift and strong, like a lioness protecting her self and her loved ones from harm. A virgin is a woman who has opened her heart and embraced her own shadow and in doing so she has broken open her power to love and heal herself, her community and her world in all directions of time. A virgin is a woman as comfortable with paradox and mystery as she is with the sun, the moon and the stars. I am becoming "Like a Virgin" as I enter my crone years! How incongruous does that sound? I love this mysterious adventure! I am lovin the ability to pop right over to someone's blog after checking a comment! Thanks for kind words and lovely virgin/mother image on this post, very regal but warm. I couldn't agree more with your commentary, she's really a universal symbol. An aside, did you know a kwan win started out as a male? Must have seen the error of his ways! Good to hear from you! Hey Kathy! Congrats on a fabulous Blog! First off, it looks so professional! I love the banner - so You! Second, I enjoyed your comments about the Goddess. When you come back to Portland, if you haven't already visited the Grotto - a Catholic sanctuary devoted to Mary, you'll enjoy the visit. (It's about 7" from the Art and Soul Retreat!). Third - Congrats on having your jewelry at SAKS! I'm impressed! Good for you! I popped over here from your comment at Shirley's blog. This is how you respond to posted comments: You just click on the name of the person at the end of their comment. That should either take you to their blog or email address in your mail application. Their blog might have a link to "email me" and then you can go direct. Otherwise you can leave a comment on their blog and mention a thank you for their comment on yours. If it doesn't take you anywhere but to some dead end, you don't owe a comment. Some blog authors actually post their comments after the other people's comments and if you get some regular people commenting here, they will learn if that is the way you want to do it. I enjoyed reading what you have here so far. Pretty jewelry and very interesting info about SoulCollage. I wish you much success. What great information on the virgin. I had no idea. Thank you for sharing these pearls! Have a wonderful weekend, and...I'm looking forward to out 'girls time out' in a few weeks! reading the same books, and same mentor in Joseph Campbell - thanks for your additional comments; we must talk more!